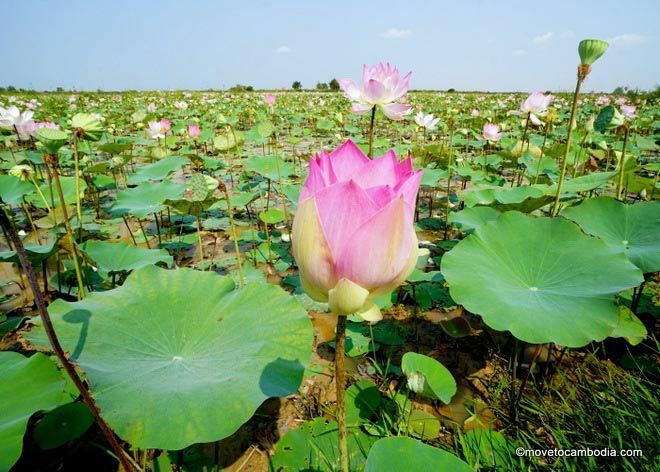 If a change of scenery is what you’re after, spend a day at the lotus farms before heading to Phnom Krom for sunset. Just a fifteen minute tuk-tuk ride (or easy bike ride) away from the center of town down route 63, where shops and local markets give way to green rice paddies and picturesque lotus farms. Choose one of these many hang-out spots, some with huts, others with a large deck and ample hammocks. If there is an entrance fee, it is usually only 2000 riel. On weekends I like to go with friends to and spend a few hours in a thatch hut, ordering food and drinks and enjoying conversation or music in calm surroundings. Once the sun is beginning to sink lower in the sky, head further down the road towards Phnom Krom. The villages around the base of the mountain are examples of some of the most severe poverty you will find near Siem Reap. If you have time, it’s worth stopping and talking to the locals before checking out the pagoda, and trying and support local businesses while you are here by buying drinks and snacks. I usually devour some dried shrimp cakes or hot wings at the bottom of the mountain before climbing the stairs past grazing mountain goats to the top. The summit of Phnom Krom can only be reached by motorbike, bicycle, or by foot. Although this has become a more popular destination lately, it is still visited mostly by locals and is worth bringing a picnic to the far side of the mountain to sit on a rock and watch the sun set on the rice paddies and Tonle Sap in the distance. West Baray is as close to a beach as Siem Reap gets. If you’re searching for the closest experience you can get to a day at the beach near Siem Reap, head towards the West Baray, located near the airport on National Road 6. This is a twenty-minute motorbike or tuk-tuk ride or a nice long bike ride to warm up the legs. This reservoir was created during the Angkorian era in order to supply the people with water for rice cultivation during the dry season. Make your way around the baray for a stop at some ancient temple ruins or a gorgeous pagoda with a view onto the reservoir, or head closer to the water to find many restaurants with hammocks on the shores. Although I wouldn’t recommend swimming here, you will still find some peace and quiet in these tranquil surroundings, as well as plenty of street food vendors to satisfy your appetite. 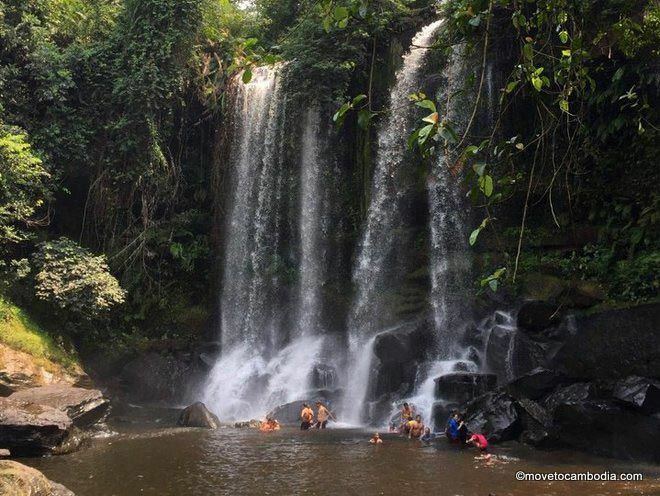 Cool off at the waterfalls at Phnom Kulen. Although a ticket to this national park is $20, it is well worth the price to spend the day on this sacred mountain. About an hour and a half from the city center, Phnom Kulen is best explored by motorbike, but you can also get there by car or bus. There are many tour options for Phnom Kulen, including motorbike, jeep, and car tours with Siem Reap Surroundings or large open-group van tours with Blue Bird Tours. Kulen Mountain is known for being the birthplace of the Khmer Empire, and its jungle hosts many secrets, such as a pagoda set high on rocks deep within the forest, a sparkling waterfall, the river of a thousand lingas, and many more. Spend the day following jungle paths to incredible sites, or cool off by the waterfall. Some may enjoy it, but I avoid swimming underneath the waterfall to avoid fish that nip at my legs and feet! Kulen mountain is perfect for a day’s adventure out of town to be spent in the cooler temperatures of the jungle and all of its mysteries. One of the floating villages outside of Siem Reap. 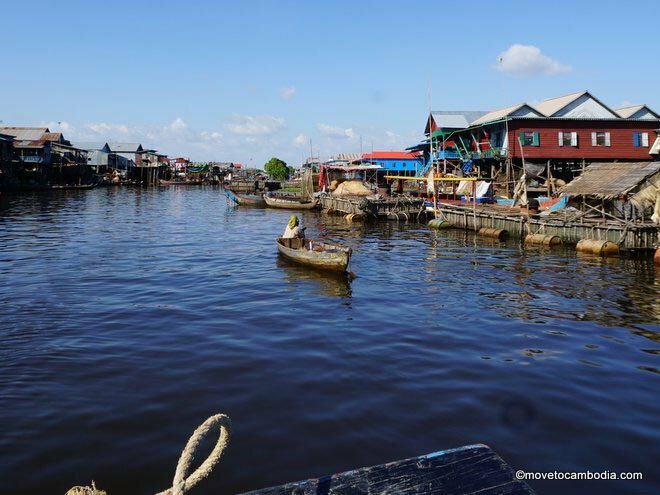 Beware of organized tours that take you to the floating villages of Tonle Sap, as often they overcharge and as soon as you get off the bus at the lake you will be pestered by young children asking for money. Instead, make your way to Kampong Khleang by tuk-tuk or motorbike and negotiate prices with a local boat driver to take you around for the day. 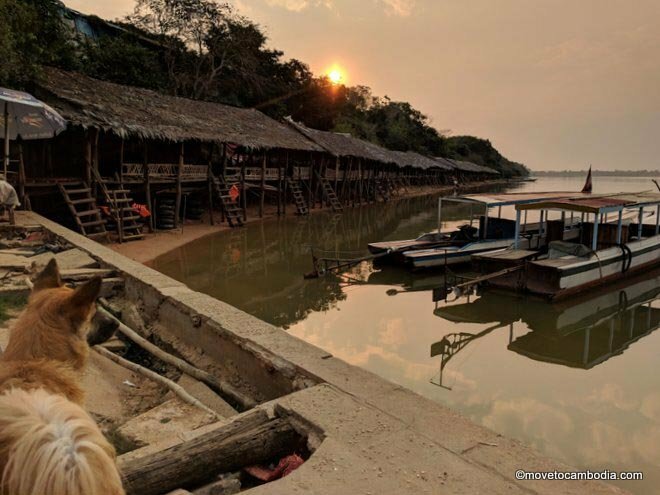 This activity is best enjoyed during the rainy season from June to September, when the stilted houses and floating restaurants are truly floating. I first tasted crocodile on one of these restaurants, and although it was overpriced the flavor was fantastic. Once your exploration is over, take in the sunset from the surface of Southeast Asia’s largest body of freshwater. When in need of a quick getaway from town, I often get on my bike and pedal down side streets until I find myself in the countryside. The wonderful thing about Siem Reap is that the development of the city doesn’t extend far beyond the center, allowing you to access the countryside fairly quickly. Wherever you go on Cambodia’s red dirt roads, be sure to wear a mask so you can breathe deeply as you enjoy a peaceful day trip away from the city. This entry was posted in Siem Reap and tagged lotus farm, Phnom Kulen, West Baray, Phnom Krom, day trips. Bookmark the permalink.